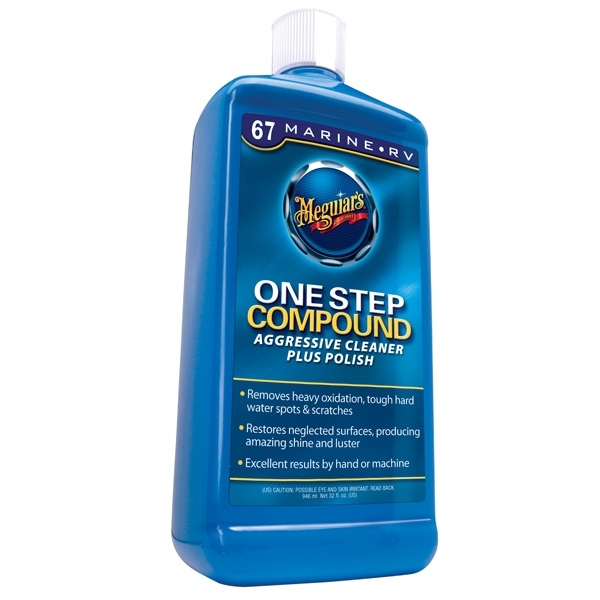 Meguiar's Boat/RV One Step Compound is an aggressive, yet safe, one-step compound that will clean and restore gloss to the gel coat surface in one step. Removes moderate-heavy oxidation, scratches, stains and tough water spots on all fiberglass and painted gel coat marine or RV surfaces. Restores color and leaves a rich gloss on the treated surface. Incredible results by hand or machine. 3M Marine Rubbing Compound, 09004 - 16 oz. Meguiar's Boat/RV Professional Grade Power Compound #91, M9132 - 32 oz.